Destinations Budapest Italy Krakow Liechtenstein Paris Prague Switzerland Vienna Montreal Alabama Greenville Asheville Idaho New Orleans New York City Little Rock San Antonio Waco Washington State Washington D.C.
4 Nomads traveling the World and encouraging others to do the same! We recently embarked on the ultimate adventure with toddlers; Walt Disney World. I have been skeptical of Disney since we’ve had kids. I couldn’t imagine the park, the crowds, or the lines with 2 toddlers in tow. However, we decided to take on the challenge for our son’s second birthday! I knew I wanted to try to save money where ever we could without losing anything in the experience. I called around, did some research myself and I decided to stay off property and forgo the meal plan. Overall, Disney World was a complete success….except the fact that 3/4 of us got a horrible 24 hour stomach bug. DIsney World is inherently expensive. I wanted to help you create a budget for Disney World by having a starting place. In order to know exactly how much we spent, I went through all of our receipts and charges. I tallied up how much we spent at Disney World and where we spent it. I compared my actual cost to my my estimated cost if we had stayed on Disney Property with a meal plan. Below you will find exactly how much a 5 day, 4 night trip to Disney cost my family of four. At the very end, I also share a few ways we could have saved even more. 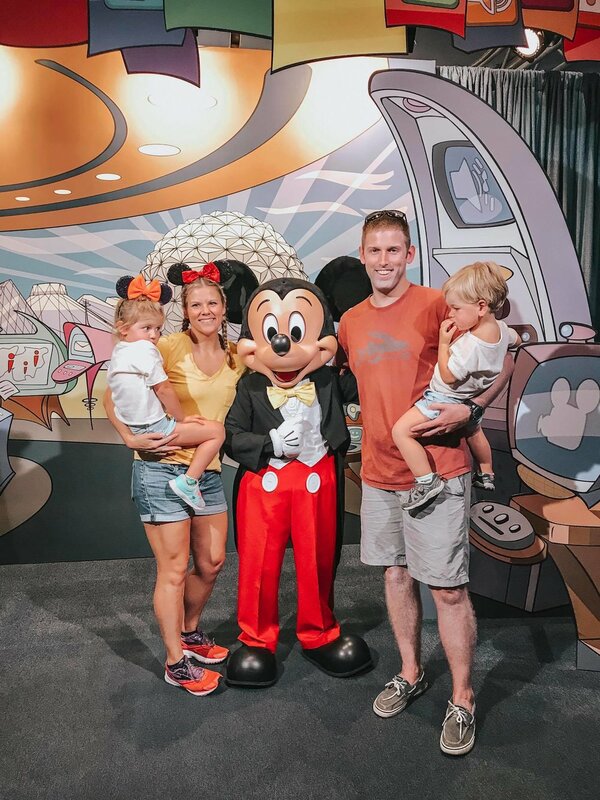 So, here is how to budget for Disney World for a family of 4. We used the Military 4-Day Park Hopper. We had to buy 3 passes. Latham didn’t need one because he is under 3. For military families, you can head to the nearest base ITT office to get your Military Ticket. Somehow I didn’t take any photos of the hotel room except this one. what an epic fail. This is the living room area of the hotel — the couch pulls out to a third bed if needed. We decided to take advantage of a Timeshare Presentation package. This means we had to spend about 3 hours listening to a presentation and saying no a thousand times. If we didn’t’ have kids with us, I would definitely do this again to save a little money. We stayed at the Holiday Inn Resort Orlando Suites - Waterpark. Our room was a 2-bedroom family suite. This means we had a king bed in a room with a door, a second room with a bunk bed. The lower bunk was a full size bed and the top a twin. We had a decent sized bathroom, large living room and a kitchenette with dining table. The resort had a fantastic waterpark, restaurants on property and it did offer a Disney Shuttle. This is how much we paid for gas driving to Disney World. Our drive was 6.5 hours from Pensacola to the hotel. We decided to make our own breakfasts, lunches and some of our dinners. This cost includes Latham’s birthday cake & medicine for the kids. We packed a small cooler of snacks, drinks and lunches for the park each day. Be creative in packing lunches for Disney World. There are plenty of places to stop for a snack or to have a picnic. Our first night we decided to splurge on a Disney Property dinner. We ate a Kona Cafe at the Polynesian resort. We had an appetizer, 1 kid meal, 2 adult dinners and 3 adult beverages. I was excited to learn that the kid’s meal came with ice cream AND the waitress brought Latham this amazing birthday cupcake for free! Our last night we decided to stop at Chipotle on our way back to the hotel. This is how much it cost us to drive to Disney World. We stopped for gas, snacks and couple meals along our two drives. Doing laundry at Disney is unavoidable. Since both of our kids got a stomach virus on our trip, we had to do a lot of laundry at the hotel. It was an unexpected and expensive cost IMO. We DID, however, get some Delta Miles for this unexpected purchase. If you’re not using a credit card to earn miles or points, you’re doing it wrong! Go HERE to read more about what we use! How much cash do you need to bring to Disney World? We brought $100 cash, plus were given the $199 back in cash for sitting through the presentation, and we had a $150 Visa Gift Card. We were not strict about spending with these and decided to use this money as “fun money” in the parks. We enjoyed tons of food/drinks at Epcot International Food & Wine Festival, balloons for the kids, a few random drinks/treats, and even bought tickets to play games at Dino Land in Animal Kingdrom. One huge unexpected cost was $87 for 2 t-shirts and 1 towel to replace/clean up our stuff that got puked on inside the park. For some reason we had 3 random park purchases with a card for drinks and 2 dole whips. Save money at Disney World by NOT buying souveniers in the park. We decided to pre-buy our kid’s some souveniers so we wouldn’t be tempted by the shops inside the parks. We gave them to the kids at night in our hotel room and told them that Mickey droppped them off as presents. It was our son’s second birthday, so these gifts doubled as birthday presents. Before we decided on where we would stay, we asked for a few quotes for cost for staying on Disney property. The lowest quote we received was for $689 for a studio style hotel room. There are perks to staying on property. Namely the shuttle system. However, we wanted the extra space and the $75 we paid to park was optional as our hotel also provided a shuttle. My estimated cost if we had stayed on Disney Property at the lowest priced hotel, gotten the dining plan, & spent the way we did anyway in the parks! Donald duck in Animal kingdom! Not buy souvenirs in the park shops. It was $87 for 2 t-shirts and 1 towel when we had to buy shirts and a towel to clean up throw up. Talk about some sticker shock. We bought all of our actual souvenirs at the Disney Outlet and Wal-Mart before we left for the trip. Do you have any money saving tips for Disney World? Put them in the comments!! Big Brave Nomad is a participant in the Amazon Services LLC Associates Program, an affiliate advertising program designed to provide a means for website owners to earn advertising fees by advertising and linking to amazon.com, audible.com, and any other website that may be affiliated with Amazon Service LLC Associates Program. We are a U.S. Military Family of 4 traveling the world one approved leave at a time. We want to inspire other families to Brave the World with their kids! Don’t see what your’re looking for? Search HERE! Join our once a month e-mail so we can help you travel more! Thank you! We can't wait to see where the World takes you!